Go ahead, lift and toss the pots if you need to refill your hearts, then push the statue to the left. Go on, get rid of the enemies, then walk on the four buttons to light the torches. Pick up the Small Key in the chest and open the door. Pull the lever at the top, cross the bridge, then pull the toadstool and let it go to jump! Go up. Climb the ladder to the right, walk on the switch, then get into the barrel. Exit from the other side, go down and climb the ladder. Push the statue on the switch, walk on the other switch, then go back into the barrel. Walk south and get out through the opening on the left. Go left. Go on to the left, pull the toadstool as much as possible, let go and climb the ladder. Open the chest to get the Map, then jump south. Pull again the toadstool until halfway, let go and go left. Get rid of the enemies, then push the pot on the switch. Cross the bridge and go down. Push and pull the two statues on the two switches to pick up the Small Key in the chest. Push one of the statues to get out, then come back up and right twice (by pushing a block down). Get into the barrel once more and get out through the opening on the right. Open the door on the right. Pull the toadstool, get past the hole, walk on the switch, pull the other toadstool and go right. 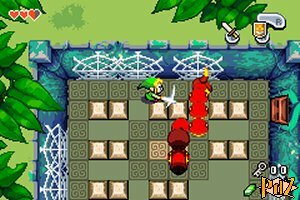 Fight off the enemies, pull the statue on the right as much as possible, then walk around the room and push the other statue on the switch. Go up. Get rid of the enemies, pick up the Small Key and go left. Climb the ladder, go up, jump to the right and go down the stairs. Push the right block up and the left block to the left. Pick up the Compass in the chest and go back to the upper floor. Go left. Open the door on the left to fight your first mini-boss! Hit the head when the enemy is blue, then quickly hit the tail several times. Do this three to four times, then open the chest to get the Gust Jar. Use your Jar on the web to the bottom right and go down. Pick up the Piece of Heart and go back up. Use the Jar on the web to the bottom right to get back into the room to the right. Walk on the switch, then thanks to the Gust Jar, vacuum the sand on the left of the switch. 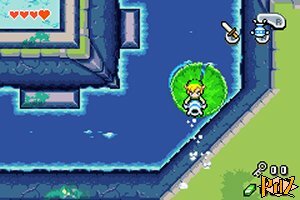 Walk on the second switch to make a warp tile appear. Vacuum the remaining sand in the room to switch on two other buttons that will make two chests appear. Pick up 10 mysterious shells in each chest, then go back to the right. Vacuum the sand with the Gust Jar, walk on the switch and you will find another 20 mysterious shells. Go back left and go down. Push the block to go left, vacuum the sand and open another chest withholding 10 mysterious shells. Go back into the barrel and go back in the very first room. Step on the warp tile, then pick up a Piece of Heart and step on the warp tile again. Go back in the barrel room and get into it. Make it roll, vacuum the web blocking one of the openings and get through it. Use the Gust Jar to draw the water lily at you, then get on it, and use the Gust Jar to move around. Go down the waterfall, go east, then north and east. Climb the ladder, push a pot on the switch and get back on the water lily. Go on to the northeast. Lead the water lily next to the torches, then push a pot on the switch. Walk on the water lily and pick up the Small Key in the chest. Go back southeast, then west, go on northwest and open the door. Pull the toadstool to go across the hole, then vacuum the following three to get close to the chest. Open it and pick up the Big Key. Then walk on the switch and step on the warp tile. Use the Gust Jar to get rid of the web on the left, go down the stairs, push the block and get 20 rupees from the chest. Climb back up, get rid of the web on the right and go down the stairs. Vacuum the toadstool to go across the hole, then go down and vacuum it again to reach the boss door. Break the pots if you need to refill your hearts and open the door. 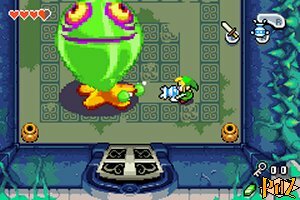 Probably an Easter egg from "The Wind Waker", a mere green blob is your first boss! Use the Gust Jar to vacuum its "feet", then when it doesn't move anymore, hit it as much as possible. Its head will fall down, keep on hitting it with your sword. Do this three to four times to defeat it. You are then rewarded with the Earth Element. Pick up the Heart Container, then step on the warp tile. 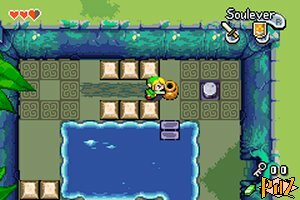 Go back to the Minish Village and pay another visit to the Elder. Speak to him, he will advise you to go to Mt. Crenel. Go left to get out.